NYC, 02/08/2019, 6:00PM. 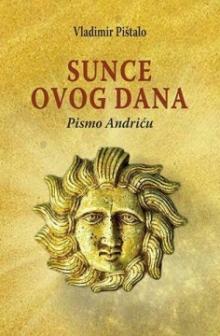 The Sun of This Day: A Letter to Ivo Andrić. Author Vladimir Pištalo discusses Ivo Andrić (1892-1975), a Yugoslav novelist, poet and short story writer who won the Nobel Prize in Literature in 1961. Pištalo's conversation with Ivo Andrić is a conversation with the tradition. It shows us a different Andrić, more emotional, more playful, more passionate. It is also a dialogue between two moments in history: the decolonization that marked Andrić's era, and neocolonialism. Vladimir Pištalo was born in Sarajevo in 1960. He studied law in Belgrade and Sarajevo and received a PhD in American history from the University of New Hampshire. Pištalo’s first story was published in a literary magazine when he was eighteen, and his first book was published when he was twenty-one. Since that time, he has published eleven books of fiction. Tesla: A Portrait with Masks, his first book to be translated into English, won the 2008 NIN Literary Award, the most prestigious award in Serbia, and has appeared in ten languages. He teaches U.S. and world history at Becker College in Massachusetts.